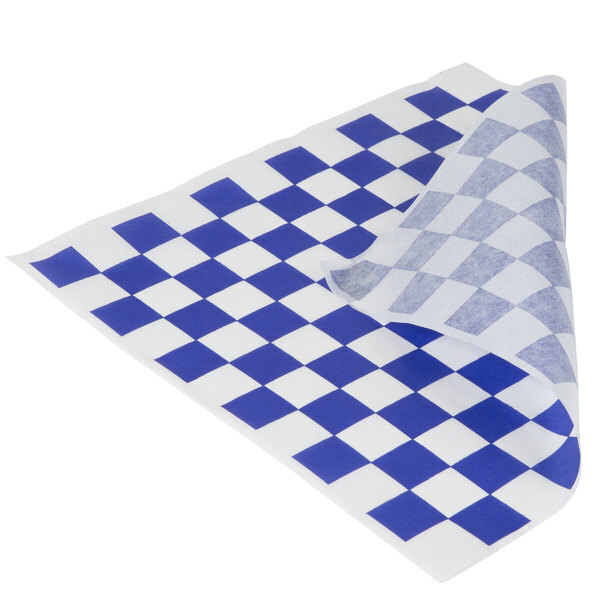 Give your take out snacks or combo platters an attention-grabbing kick of color with this Choice 12" x 12" blue check deli sandwich wrap paper. 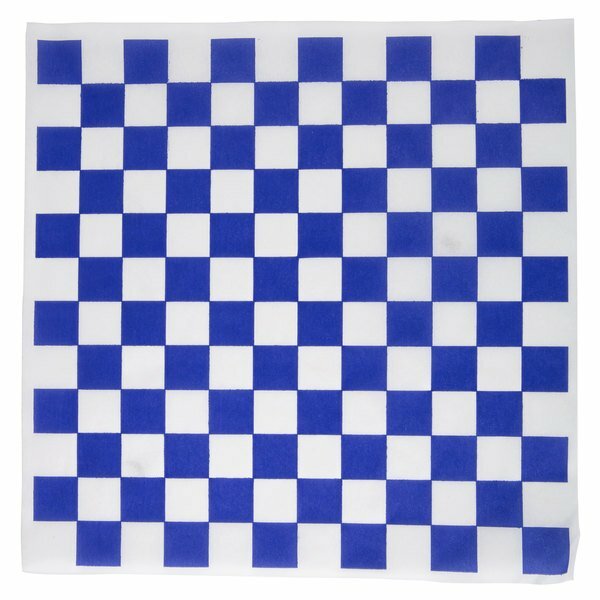 Featuring a bright blue check design, this Choice 12" x 12" blue check deli sandwich wrap paper brings a fun and exciting pattern that enhances your venue's personality. Use it to wrap sandwiches, burgers, hot dogs, and bratwursts, or line serving baskets with this playful paper. "These work great for wrapping small sandwiches or lining a plastic serving basket. I have tried ordering these from my foodservice provider and a local paper supplier, they can't come close to this price." 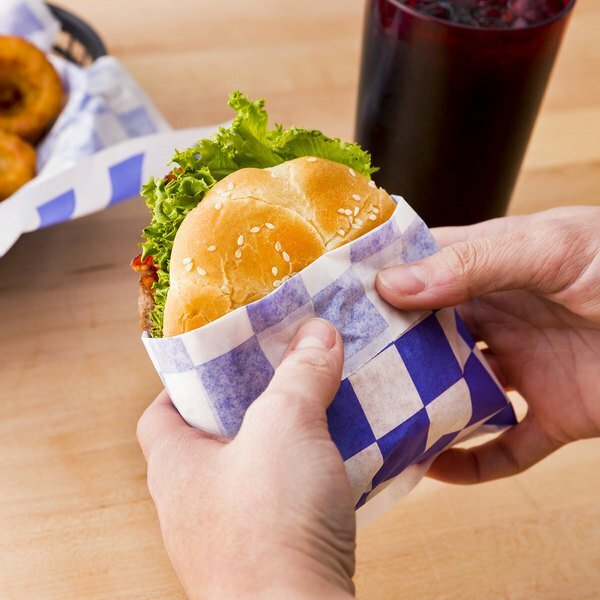 This sandwich wrap paper features a grease-resistant surface that won't absorb excess grease, keeping messes minimal. Whether you're serving deep-fried delicacies or farm-fresh favorites, you can be sure that your guests won't get covered in grease thanks to this paper's protective surface. 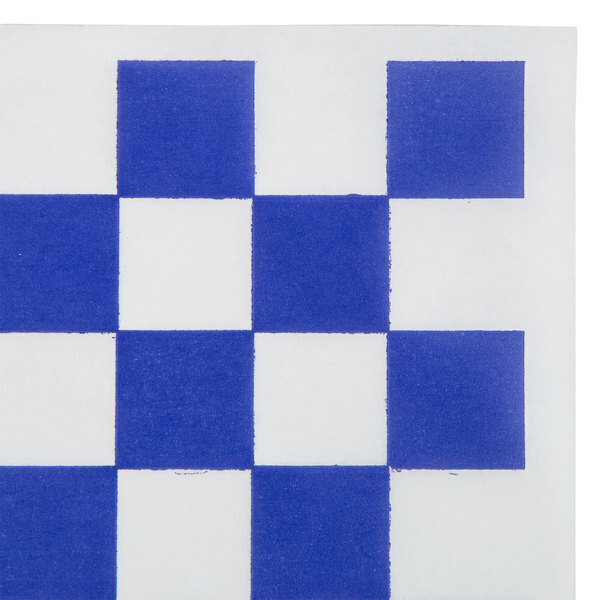 With a fun, blue and white checker pattern, this paper brings retro flair to modern life. Your guests will appreciate the old-school appearance as they dine at your vintage venue. Kids' meals work well with this paper, as do combo meals, appetizers, and other casual cuisine. 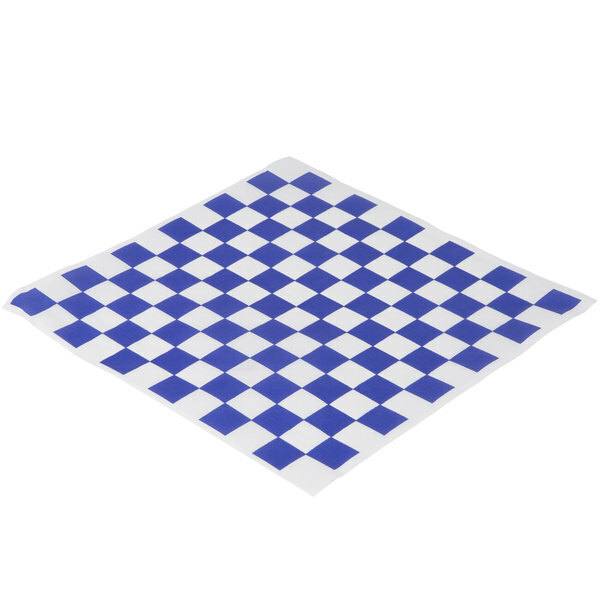 A 12" x 12" size makes this sandwich wrap paper ideal for virtually all applications. From wrapping sandwiches to lining baskets, this paper is large enough to get the job done, quickly and efficiently. Plus, since it is pre-cut to the 12" x 12" dimension, this paper ensures consistency for cost savings. I love this brand of wax paper. Big and can be cut precisely very easily. The color really pops and makes food look very appealing and makes it stand out more. 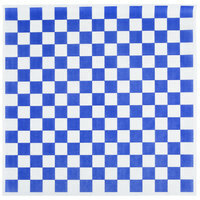 For a german themed foodservice kitchen we like the blue and white checkered pattern which is typical Bavarian style. Grease resistant feature is a bonus. They are cheap and thin just perfect for a disposable item. We love the available color options of these liners and frequently change them to coordinate with whatever holidays are near. They add the perfect pop of color! Definitely great! We use multiple colors from you guys and they have been great and quite useful for not only wrapping burritos but as well as tray liners! Very good product for lining baskets and serving food on. The blue dye does leak a little when product is heated so we do not reccomend placing in an oven or close to hot areas. Very easy cleanup for customers. Great product and very colorful. 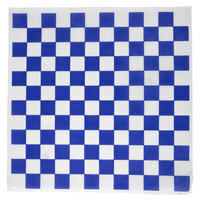 We use these in our German Restaurant and it goes with the Bavarian colors. They hold up well under use and have had no problems with them. Recommend them for use in baskets or where ever you need a sturdy grease resistant paper. Love Em! No one in our area carries these in blue. I was very pleased to find them. We use them as boat liners for all our food items. Makes for a great presentation. Amazing color i love it!! perfect for sea food, with the right basket, and perfect food is the best trio, i love this linner works perfect! These liners are perfect for an Oktoberfest promotion and really add a pop of color under a burger. If buying in quantity, they are significantly less expensive even with shipping than the 2-day shipping option others offer. It absorbs grease and is sturdy, not flimsy. 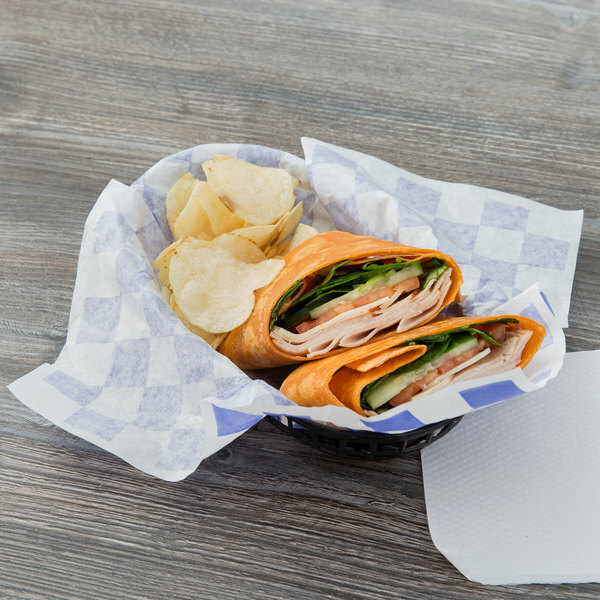 We use Choice 12" x 12" Blue Check Deli Sandwich Wrap Paper - 1000/Pack at Grains and Taps to hold our chips for the Chips and Queso that we serve. These sandwich papers are perfectly sized to our baskets and make clean up a breeze, just wrap up whatever is left and discard the paper. We highly recommend this product to others with similar needs. These liners look great, function very well and have super price. With all the colors available, there is one for any operation. Definitely a good buy! Deli wraps perfect size for sandwiches, burgers, wraps, etc. We use the blue because that is our color but also available in other colors you choose. This deli wrap is great for lining baskets and styro-foam containers. It absorbs grease and also prevents the styro-foam from melting do to hot food. Good product and well priced. deli paper exactly as described. I ordered these to serve our appetizers in a slightly smaller basket than sandwiches and wraps. Good quality for the price and i would recommend this product. These are a staple in my restaurant. Lines all of our sandwiches and appetizers. Matches our color theme Comes in different colors to match holidays and special party themes! If you're buying in bulk, this is definitely the pack for you! great quality sheets at a very versatile size. Perfect for lining baskets, or wrapping burgers and sandwiches. Very happy with my purchase. I originally saw these on "Top Chef." The whimsical color stands out in a crowd. We line our foam containers and wrap individual sandwiches in these. Great price on this deli paper, I use it with all of our sandwiches and specials. They make the food look great, they add a nice touch!